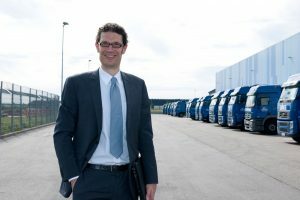 Freiburg logistics marketplace Cargoclix shows for the first time the estimated time of arrival of a truck in the timeslot based on telematics data. The Breisgauer company explains innovations in the timeslot management “SLOT” and the tendering platform “TENDER”. Timeslot management division grows strongly. (Freiburg i.Br., 19.12.2018) The software specialist Cargoclix brings a new product from Breisgau to the intralogistics fair LogiMAT in Stuttgart. From the 19th to the 21st of February 2019, the company will show visitors at its stand in Hall 6 how the Estimated Time of Arrival (ETA) of a vehicle is generated with the aid of telematics data during timeslot booking. To see the estimated time of arrival of a truck at the ramp, dispatchers and drivers have to use an app today. “This app is now superfluous. With the telematics ETA, the booked timeslot automatically runs against real time,” stresses Cargoclix shareholder Prof. Dr. Victor Meier. Thanks to the new function, ramp operators can now see whether a truck arrives at its destination later or earlier than planned. To do this, it is sufficient to enter the vehicle’s registration number when booking the timeslot. Cargoclix works together with the software specialists of PTV Group and Agheera GmbH. The new function also has advantages for truck drivers: they no longer have to communicate traffic jams or unforeseeable changes in driving times to the ramp operators, but can concentrate fully on the traffic. In order to be able to offer users the relevant information, the tool retrieves the GPS location data of a truck every ten minutes and calculates the remaining driving time in the route planner. For data protection reasons, however, these are not stored, but deleted immediately after the ETA calculation. Tracking of the truck is thus excluded. Cargoclix has already won a pilot customer for the new SLOT function: Arla Foods Deutschland GmbH. The dairy company has recently started using the ETA calculation via telematics in timeslot management for its truck fleet at the Krefeld logistics location. At the largest annual intralogistics fair, specialists from Cargoclix explain not only this premiere, but also the general advantages of the SLOT timeslot management system, which is one of the most popular timeslot managment systems. The system is used across industries in industry, commerce, and logistics service providers and, with a rapidly growing user base of currently 50,000 users, is not only one of the most widespread timeslot systems, but also one of the cheapest, with 50 cents per booking. Since 2011, Cargoclix has recorded mid-three-digit growth in this business area. “Because road traffic continues to increase, timeslot management is indispensable for companies. A good system is characterised by flexible adaptation, simple operation and low costs. Dynamic functions make the processes even more efficient for ramp operators and transporters”, says Cargoclix shareholder Prof. Dr. Victor Meier. Cargoclix also has the logistics platform TENDER in its luggage in the Swabian metropolis, which with more than 28,000 users is one of the leading international tender platforms for transport and logistics contracts. We are pleased about a specimen copy!